With Lander, users get a powerful, feature-packed landing page builder with a high level of granular control and a wide-reaching set of analytics tools. The learning curve is a fair bit steeper, however, so beginners should be prepared to invest more time and effort into learning the software. There is a free trial which allows users to experiment a bit before taking the plunge, but users should be aware that the plans can get relatively more expensive if you’re expecting quite a number of visitors to your landing pages. With mobile traffic constantly on the rise, it’s good to know that page builders like Lander offer a mobile version of their landing page creator, to help improve mobile conversion rates. The Lander editor is powerful and packed with useful features and tools to help you generate income out of your landing pages. The 14 days free trial gives you the chance to explore the interface before you purchase a plan. Want to know if Lander is right for you? Lander offers a decent amount of templates, which are all clean and modern looking, and suitable for any screen size. Selection: Unlike many of its competitors, who arrange their templates according to industry type, Lander is a lot more focused on the use case scenario, and offers a few solid sample pages to collect leads, subscribers, or CTA (call-to-action) pages. 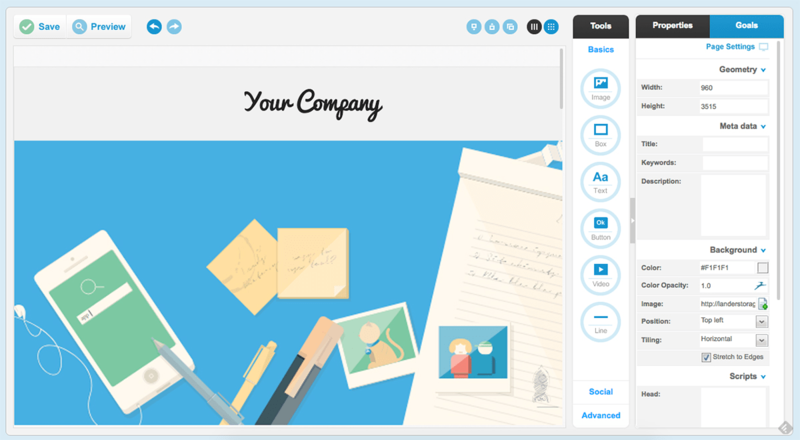 Customization: These templates can be customized from header-to-footer, including up, hover, and active button statuses. Clicking on a button or other object reveals its editable properties on the right. Whether you are looking for a sturdy A/B testing tool to improve site conversions, or you just want to integrate lander with your favourite third-party services such as Mailchimp, Salesforce and Google Analytics, the possibilities are endless. Track conversion charts, implement a PayPal payment gateway and create a sense of urgency for offers with a countdown tool. When you come to using a landing page designer, the last thing you want is clutter and confusion, so this is where Lander makes it as simple as possible for you. Use the simple drag-and-drop tool to move images around your page. With all features are accessible with a single click, you can see why Lander is a popular choice for many newbies out there. The editor window groups all the Tools at the right with Basic elements (images, text, lines) Social (Like buttons, etc.) and Advanced (HTML) for easy use. Clicking on an item or its pencil icon allows you to tweak the various properties. Lander promises you a helping hand, but the limits chat and email support for Basic users. However, the Knowledge Base is quite extensive, with articles and videos to answer any question. Lander offers a lot of good features, but becomes expensive if you have a lot of visitors on your pages. Each plan entitles you for a free 2 weeks trial with no credit card required. After your free trial ends, your account will go into freeze mode. Your pages will become unpublished, but the interface will still be available and all of your data will be saved until you decide to upgrade. Lander is a great choice for beginners, especially because there is a free plan with which to experiment. Their easy builder will get you hooked, but if you need more features or visitors, you’ll need to upgrade your account. Pro users will also like it and find value in their offerings. Like Lander review? Visit Lander.